It looks like a good spring for forsythia this year. I’m seeing plenty of yellow flowers on forsythia shrubs all around our area. Some bushes have loads of flowers while others look not quite as nice. The difference is, gardeners with forsythia loaded with flowers have taken the time to prune their shrubs, while the others have just let their shrubs fend for themselves. Unfortunately, some people prune their forsythia right along with their other trees and shrubs in the early spring while everything is still dormant. Forsythia flower buds grow and form during the summer then, open up and bloom in the spring. So, if you prune in the spring while the plants are dormant, you end up cutting off those flower buds that grew last year. The proper time to prune forsythia is right after the flower petals fall off of the stems. Remove the largest, coarsest stems by cutting them off right at ground level. This will stimulate your shrub to send up fresh, new stems with plenty of those flower buds we’re looking for. Next spring you’ll have a more balanced looking shrub with a profusion of yellow forsythia blossoms. Your neighbors will think you are a gardening genius. 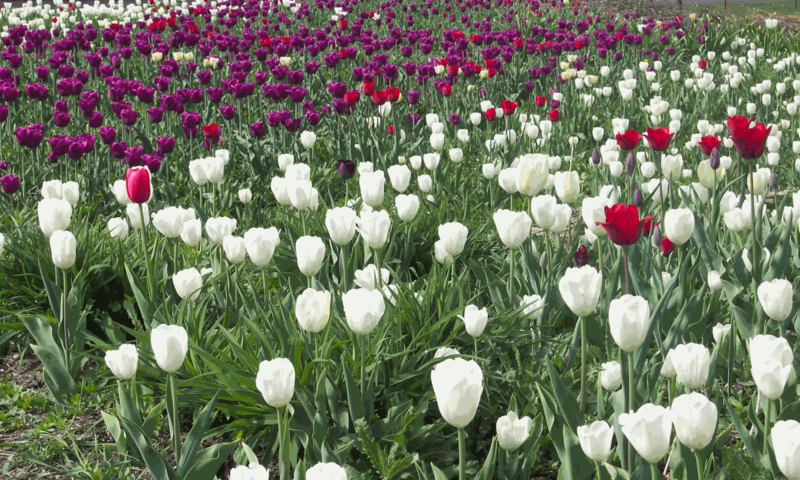 Many gardeners have been enjoying the cool spring this year — especially those who spent days and days last fall planting spring flowering bulbs. In years past, I planted as many as 20 thousand tulips, daffodils, and hyacinth bulbs in one fall season. For many years I considered 10 thousand bulbs to be a light planting year. It took my helper and me several weeks to get those flower bulbs into the ground before winter arrived. Tulips will flower much longer when the weather is cool. Then I would wait until spring to see the results of all of that work. Most of the time spring progressed normally and the bulbs put on a show that lasted for weeks. Every once-in-a-while a week of summer-like weather would occur in early spring. All of the bulbs would shoot up out of the ground, bloom, and die-back all within about a week’s time. How disappointing those springs were — one week of spring flowering for six weeks of hard work in the fall. This year we’re having a nice, slow start to spring. Our bulbs are slowly opening and their flowers look like they will stay fresh for sometime. Spring bulbs are the best reason to hope for a cool spring. Tilling the garden is a spring ritual we look forward to all winter. And after our cool, slow warm-up this spring, many of us will be tempted to get out there and till on the first warm day. Be careful though, it is possible to till too early. Tilling when there is too much moisture in the soil will cause it to form large clumps, ruining the soil structure. I did that one time early on in my gardening career. Exposure to rain and winter freezing and thawing will eventually break down those clumps. But in my case, after two years the soil was still lumpy. Squeeze the soil into a tight ball. To help you decide when to till, use this simple test: scoop up a handful of soil and compress it tightly, like you’re making a snowball. 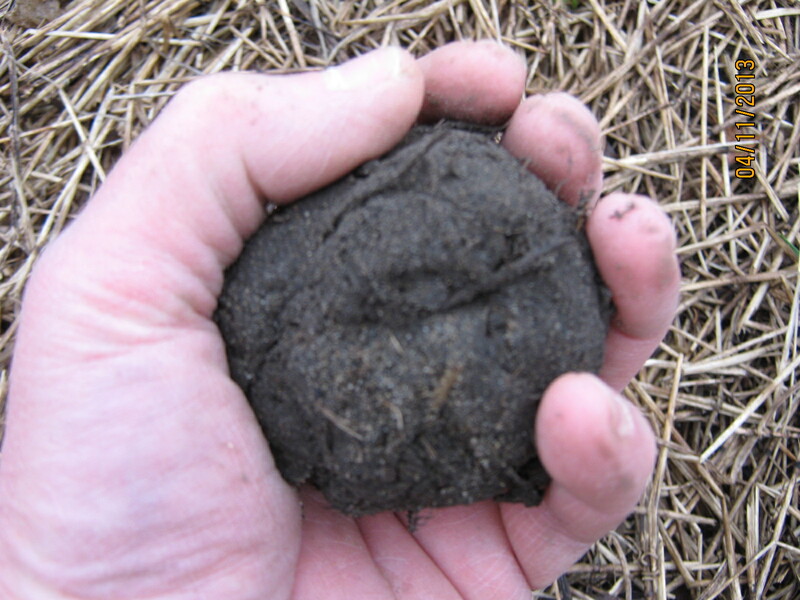 Poke the soil ball with your finger. If it crumbles apart, then it is in good enough shape to till. If it stays in a ball, then it is still too wet to till. Check each day until it passes the ball-of-soil test. Millions of Easter Lilies are flowering in homes all across the country. Most of them get tossed out after they are done blooming. A small percentage of people plan to keep their plant hoping to have it bloom next Easter. “That ain’t gonna happen”, as one famous pawnbroker on TV likes to say. 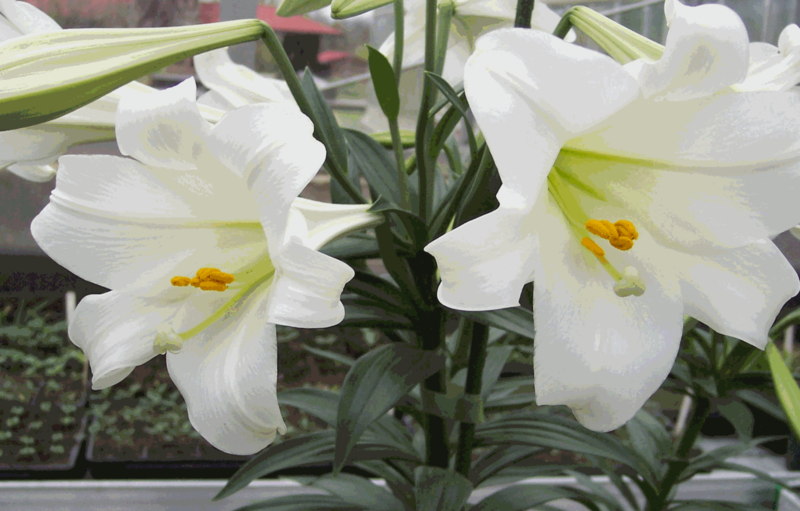 There is an art and science to getting Easter Lilies to bloom exactly on Easter weekend. And that is way beyond the skill of nearly all gardeners. Remember Easter lily flowers are brilliant white so take that into consideration when deciding where to plant outside. You can however, save your lily and have it bloom in your garden next summer. All you need to do is keep it in good shape for the next six weeks or so. The most common problem you are likely to see is water-logged roots. This happens when the foil pot wrapper is left on the pot. Since water has no where to drain, it collects in the foil and pot, drowning the roots. So, pour out any extra water from the foil wrapper or take off the wrapper completly. Keep the plant in a cool, bright spot in your house so that the leaves can do their thing with photosynthesis. In mid-May or after the last frost, plant the lily into a flower bed in full sun. Water and fertilize it along with the rest of your plants. Then, next summer and each summer after that, your lily will bloom and become a permanet part of your landscape.